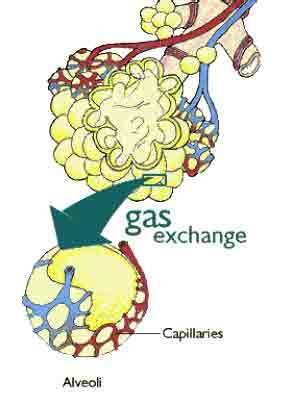 Oxygen transport into a clean, moist wound occurs via the same transport processes that govern oxygen absorption into the alveoli in lungs during breathing: diffusion. Oxygen is transported from the surrounding air to cells in a clean, moist wound (or alveoli) via the physical driving force of diffusion. In diffusion, gases (or liquids) move from an area of high concentration (partial pressure) to areas of low concentration (partial pressure). If there is a mixture of gases in a container, the pressure of each gas (partial pressure or concentration) is equal to the pressure that each gas would produce if it occupied the container alone. This applies equally well to the concentration of a gas in a liquid. If a gas (oxygen) is present above a liquid (open moist wound), the gas will diffuse into the liquid until it reaches equilibrium in concentration (partial pressure) in the liquid in proportion to that present in the gas above it. 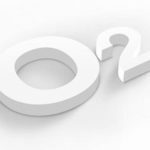 Oxygen therapies have been shown to rapidly raise oxygen levels in the wound bed, in both clinical and preclinical settings, when pure oxygen is applied directly to the surface of a moist wound at near atmospheric pressures (not hyperbaric). Preclinically, pure oxygen applied to an open wound has been shown to increase the pO2of the superficial wound tissue in pigs3. In this study, an increase of pO2 from less than 10 mmHg to 40 mmHg at a depth of 2 mm in the center of the wound bed was observed in as little as 4 minutes using an implanted probe. Hyperbaric Oxygen, Topical Oxygen and Continuous Diffusion of Oxygen.4 All three technologies are similar in that they use pure oxygen as an aid to wound healing. Hyperbaric Oxygen Therapy is used to treat a patient systemically with pure oxygen at elevated pressures. Topical Oxygen Therapy is used to treat an area directly surrounding a patient’s wound using pure oxygen at pressures slightly above atmospheric. Both of these technologies only offer treatment for a relatively short period of time (typically 90 minutes per day, 4 or 5 days per week), which means that the wound only receives supplemental oxygen for a few hours a day. Furthermore, neither of these technologies allows for patient mobility during treatment and can require significant time and expense associated with travel and preparation time for the patient. CDO Therapy continuously diffuses pure oxygen into an oxygen-compromised wound to aid in wound healing while maintaining a moist wound healing environment, maintaining patient mobility and significantly reducing costs. Results from a unique Tier 1A Diabetic Foot Ulcer clinical trial involving 100 patients, which show Continuous Diffusion of Oxygen (CDO) therapy to be statistically significant compared to a sham (placebo) arm, have been published online in Journal of Diabetes Science and Technology in February of 2017 (http://dx.doi.org/10.1177/1932296817695574). The rigor of this study is rare in the medical device world: it is a double-blind, prospective, randomly-controlled trial with a sham and an active arm. Both arms received identical treatment (device, dressings, etc.) and the devices were functional in both arms. However, the oxygen did not flow to the wound in the sham arm. In essence, this is on par with a pharmaceutical trial where the patients and clinicians do not know the treatment arm. A significantly higher proportion of people, more than twice as many (209%), healed in the active CDO arm compared to sham (46% vs 22%, P = .02). This relative effect became greater in more chronic wounds: in the most chronic wounds, more than three times (315%) as many wounds closed in the active CDO arm (42.5% vs 13.5%, P = .006). Patients randomized to the active device experienced significantly faster rates of closure relative to the sham (P < .001). As the wound size increased, the relative positive effect of CDO remained similar or became greater. Dr. David Armstrong of the SALSA Clinic, University of Arizona, is the overall principal investigator for this study. 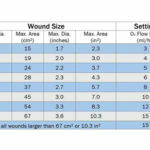 These results are bolstered by those from our post-market surveillance registry that demonstrates a success rate of 74% in 59 days in the field for a wide variety of wounds. These wounds range from small, persistent ulcers to large Stage IV ulcers and include dehisced surgical wounds, large venous ulcers, and acute surgical incisions, to name a few. It is important to note that this success rate is on very difficult wounds that have already been unresponsive to other advanced therapies such as NPWT and HBO and had been open for an average of 359 days (as a new technology, CDO is typically first tried on challenging, unresponsive wounds). A retrospective analysis on the impact of CDO in chronic toe ulcer healing for 20 patients showed an overall success rate (full closure) of 74% on wounds that were unresponsive to other therapies. The author highlighted a chief benefit being that of high patient compliance (95%), which he attributed to the device’s ease of use, the noticeability of improvement within a short period of time, and the reduction of pain. Another retrospective analysis of 25 patients in a Veteran’s Healthcare Administration environment showed 68% full closure, both as a stand-alone and adjunctive therapy. The author found that CDO improves wound healing potential, including in wounds receiving advanced tissue/ skin substitute applications. 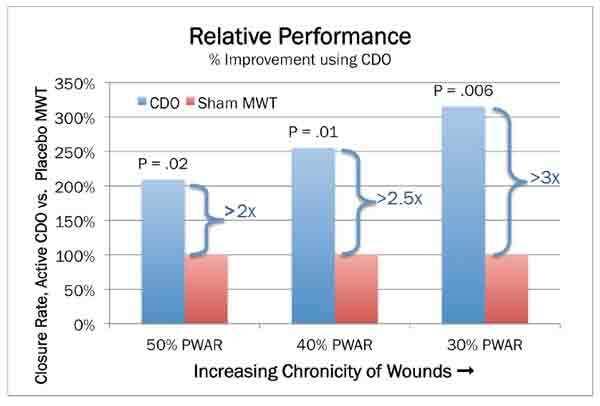 A prospective, randomized clinical trial of CDO versus MWT followed 17 patients (9 CDO, 8 MWT) for 4 weeks and found significant differences in wound volume reduction. The CDO group had an average volume reduction of 87%, whereas the MWT group had an average volume reduction of 46% (P < .05). Significant differences in the healing rate of CDO as compared to MWT were recently demonstrated in a prospective, randomized pilot clinical trial with 9 patients receiving MWT and 9 receiving CDO. The study focused on smaller DFUs (approx. 1.5 cm2), UT Grade I-III, over an 8-week period. CDO was shown to close 90% of the wounds by the end of the study, whereas the MWT group experienced 30% closure. The authors also noted significantly faster wound closure rates in the CDO arm and more notice- able differences from CDO in the more advanced ulcers (Grades II and III). For a patient who served as her own control during CDO therapy treatment, her pain levels were reported as high as 8/10 on a visual analogue score (VAS), with pain medications taken as needed, during the 5-month duration of the ulcer prior to CDO therapy. After 20 days of CDO therapy, the patient reported a pain level of 2/10 and was no longer taking pain medications. At this time, CDO therapy was temporarily discontinued since the patient was leaving town for a holiday. Six days later the patient returned to the clinic with a pain level of 10/10 and reported difficulty sleeping. CDO therapy was reapplied and, within three days, the patient’s pain level was controlled (VAS 2/10) and she ceased taking narcotics. In an uncontrolled, nonrandomized study of 10 patients with venous ulcers, CDO therapy was reported to significantly (P < .009) reduce pain in a six-week period. The corresponding mean reduction in wound size was 58.9%. In a case series review, four patients with severe, very painful wounds were successfully closed and the pain was significantly reduced in all cases. A six patient case review of CDO in patients with diabetes and chronic lower extremity wounds reported significant pain reduction. 1 EO2 Concepts White Paper. 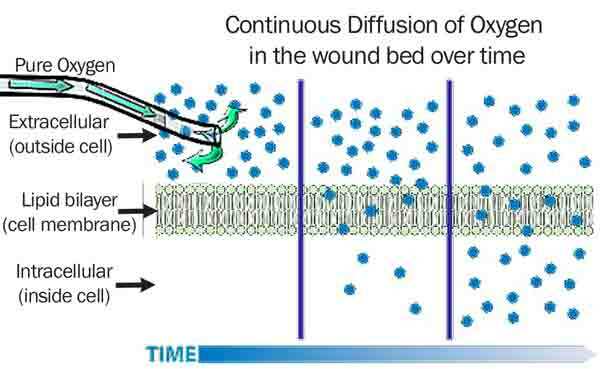 How Oxygen Works in Wound Healing. p/n 690024 rev 0317. 2 P. W. Atkins, Physical Chemistry, 6th ed., Oxford University Press, 1998. Henry’s law constant for oxygen taken from Table 7.1 on page 174. 3 Fries, RB, Wallace, WA and Roy, S. Dermal excisional wound healing in pigs following treatment with topically applied pure oxygen. Mutat Res. 2005, 579, pp. 172-81. 4 Howard MA, Asmis R, Evans KK, Mustoe TA. Oxygen and wound care- A review of current therapeutic modalities and future direction. Wound Rep Reg. 2013; 21(4):503-511. 6 Urrea-Botero G. Can continuous diffusion of oxygen heal chronic toe ulcers? Podiatry Today. 2015;28(10). 7 Couture M. Does continuous diffusion of oxygen have potential in chronic diabetic foot ulcers? Podiatry Today. 2015;28(12). 8 Driver VR, Yao M, Kantarci A, Gu G, Park N, Hasturk H. A prospective, randomized clinical study evaluating the effect of transdermal continuous oxygen therapy on biological pro- cesses and foot ulcer healing in persons with diabetes mellitus. Ostomy Wound Manage. 2013;59(11):19-26. 9 Yu J, Lu S, McLaren A, Perry JA, Cross KM. Topical oxy- gen therapy results in complete wound healing in diabetic foot ulcers. Wound Rep Regen. 2016;24(6):1066-1072. 10 Brannick B, Engelthaler M, Jadzak J, Wu S. A closer look at continuous diffusion of oxygen therapy for a chronic, painful venous leg ulcer. Podiatry Today. 2014;27(11). 11 Mani R. Topical oxygen therapy for chronic wounds: a report on the potential of Inotec, a new device for delivering oxygen to chronic wounds. J Wound Technol. 2010;9:1-4. 12 Lowell DL, Nicklas B, Weeily W, Johnson F, Lyons MC. Transdermal continuous oxygen therapy as an adjunct for treatment of recalcitrant and painful wounds. Foot Ankle Online J. 2009;2(9):4. 13 Hirsh F, Berlin SJ, Holtz A. Transdermal oxygen delivery to wounds: a report of 6 cases. Adv Skin Wound Care. 2008;22:20-24. EO2 Concepts is an advanced wound care technology company based in San Antonio, TX. 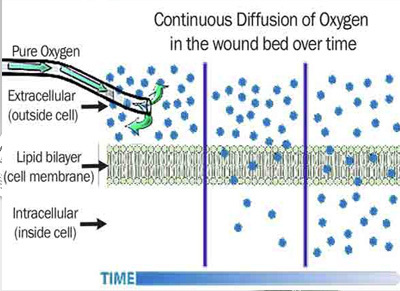 As the developer of a progressive FDA cleared Class II, CE marked medical device, they provide Continuous Diffusion of Oxygen (CDO) Therapy to patients suffering from difficult-to-heal wounds.